Board index ‹ Technical ‹ Electrical / Electronics / Stereo / Lights etc. mikecg wrote: Are you testing both the diodes and resistors on the board or isolating them by disconnecting one leg from the board? i tested initially everything on the board. if the reading was not the expected reading i lifted the legs to confirm. in my board, only 1 diode needed to be lifted in order to test correctly. By this, do you mean in the end that you left the old transistor in place and laid the replacement over the top of it as in the picture? Or is that just the final test phase before removing the defective one and properly attaching the new one to the heat sink? Those are power transistors and they get very hot while operating. They need to be properly attached to the heat sink area or they will self destruct fairly quickly. Brit-Car-Nut wrote: By this, do you mean in the end that you left the old transistor in place and laid the replacement over the top of it as in the picture? Or is that just the final test phase before removing the defective one and properly attaching the new one to the heat sink? I left the old transistor where it stood, for 2 reasons. the transistor only powers up for a few seconds so, it should work fine for a long time given the ratings and workload. I had it now fitted for 3 or more weeks with daily use (its night time here both on my way to work and back) without any problems. I will report if it fails. the biggest consern i have about the transistor is that its glued on top of the old one with pretty long connector legs. i fear it will fail due to trepidation of the car/engine breaking loose the soldering joints. Hi Tuga, Happy New Year I finally got round to checking the components on the pc b and have one resistor which i have read as Brown Black Blue Gold (no 1 on my scruffy attachment) which should be 10m ohm but with one leg removed is reading 11.45 m ohm which is a bit out of tolerance but is it enough to worry?. I also spotted that one of the wire additions to the board was now not attached to to transistor that has blown also on the diagram . I have now repaired this . Can I either purchase one of your spare transistors or can you point me in the direction of the model and supplier where you got yours. João, firstly well done for fixing it but you MUST drill out the old rivet and fit a nut and bolt with a washer on the bottom. It is only a double sided board so there is nothing you can damage if you drill it out carefully. 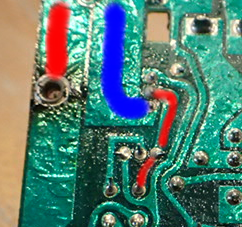 As well as the potential thermal and vibration problems above, the tab is connected to the drain (centre) connection and is the main current path through the device (shown thick red & blue in the annotated picture below) - without this connection, the current is flowing through the narrower track highlighted red which may well burn out. but I've had a better look and there is a wire link from the relay to the centre pin so it doesn't look like there is a path through the tab. Mike, although 11.45MΩ is outside the limits for a 10MΩ±5% resistor, I reckon it's near enough as it's only used in the timing circuit. GeoffSmith wrote: Mike, although 11.45MΩ is outside the limits for a 10MΩ±5% resistor, I reckon it's near enough as it's only used in the timing circuit. on your previous comment Geoff. GeoffSmith wrote: but you MUST drill out the old rivet and fit a nut and bolt with a washer on the bottom. It is only a double sided board so there is nothing you can damage if you drill it out carefully. my consern with drilling is mainly the fear of cracking the board (which would cut the working connections). GeoffSmith wrote: but I've had a better look and there is a wire link from the relay to the centre pin so it doesn't look like there is a path through the tab. mikecg wrote: Can I either purchase one of your spare transistors or can you point me in the direction of the model and supplier where you got yours. posting will cost at least 58p. plus adding the envelope cost, your better off just ordering them from ebay as well. they are pretty cheap when ordered in bulk (see this listing) as long as your willing to wait a month for them to arrive from china. in fact, i am likely to order another set of 10 in the near future. Thanks guys I have ordered some . Oi will try the piggy back option initially to prove whether I have solved the fault and then look at the posts to see if I just continue with this option as has Tuga . Drill the bottom of the rivet with a countersinking bit until you start drilling into the FR4, apply soldering iron and it will fall away top and bottom. Hi I have piggy backed the transistor and tested . Nothing cooked or melted but the RH pod did not lift . I left the legs of the burnt transistor connected and soldered onto them as I am trying to keep a fall back to SJS if my handy work fails and I don't want any issues with them rejecting my board if have tinkered with it . Will this approach affect whether the piggy back transistor works? mikecg wrote: Hi I have piggy backed the transistor and tested . Nothing cooked or melted but the RH pod did not lift . I left the legs of the burnt transistor connected and soldered onto them as I am trying to keep a fall back to SJS if my handy work fails and I don't want any issues with them rejecting my board if have tinkered with it . If there's a short circuit inside the original transistor. Your piggy back won't work. Although mine didn't have a short. If you're considering buying a replacement unit. Brit car nut probably still have them. And he does not require the old one in return. He's are genuine parts, sjs are refurbished. Not to mention even with postage and duty he's replacement unit is cheaper ( by very little) than sjs. How do you tell if it the correct way as there do not appear to be any markings? Also in and earlier message you discuss testing resistors and diodes on the pcb, what component are the numerous short black (on the back) with three legs as next to the legs of my piggy backed transistor. They look like smaller transistors with the number 024 on the top ? mikecg wrote: How do you tell if it the correct way as there do not appear to be any markings? you can use the datasheets to confirm what each connector is. from your picture, and assuming you used the exact same mosfet i have, they should be correct. mikecg wrote: what component are the numerous short black (on the back) with three legs as next to the legs of my piggy backed transistor. They look like smaller transistors with the number 024 on the top ? i would have to see a picture of what you refer to, but the fact they have 3 legs suggests they are transistors, the fact they are smaller suggests they are used to driver smaller loads. probably not mosfets, but this is pure speculation. most electronics components have printed in the body enough information to identify them. it can be tricky to identify some, but with perseverance its doable. 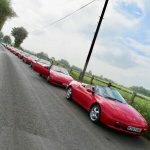 its also possible your issue is the IC which then i believe its going to be very tricky, i googled about it and got nowhere usefull... apart from the fact they can be salvaged from a dodge viper's (or some other american fast car, i dont recal exactly) unit... which retails at far more than the Elan's from my research. Hi I have tried to identify the transistor in the picture, there are 5 on the pcb. They have a manufacturer logo of an N above an N and on the top 024 and 53 then on the front the logo and 024 and below 7644. My searches have not confirmed what it is. Return to Electrical / Electronics / Stereo / Lights etc.